February 2019. Left to right: Boyko Vodenicharski, Camille Febvre, Ping Liu, Jurij Kotar, Alasdair Hayden-Wright, Omar Amjad, Adrian Leathers, Guilherme Nettesheim, Michal Walczak, Ryan Brady, Nicola Pellicciotta, Roberta Lanfranco, Viola Introini, Evelyn Hamilton, Roger Rubio Sanchez, Pietro Cicuta, Lorenzo Di Michele, Will Kaufhold. ** These are the combined Pietro and Lorenzo groups, and we're missing Mia Panlilio, Sho Takamori, Cornelius Bausch. Older photos below. Dr Roberta Liuzzi and Dr Antonio Carciati, visitors 2016. Sarra Achouri (PhD 2009-13)- to postdoc in Cambridge PDN dept. Dr Debjani Paul, now Professor at IIT Bombay, India. Several Cambridge Part III project students: Toby Ferenczi (2006, then PhD in Imperial College), Sarah Kendall (2006, then PhD in Cavendish), Katherine Shaw (2007, then at Procter and Gamble), James Adams (2006), Matthew Maitland (2006), Ben Harden (2007, then PhD in UEA), Gary Doctors (2007, then PhD in UCL), Daniel Shanahan (2009), Sabine Crevoisier (2010), Imogen Whittam (2010, now PhD in Cambridge), Dean Montgomery (2011), Ben Allum (2012), Peter Saunders (2012), Edward Cunningham (2013), Andrew Wilson (2013), Katie Moulang (2014), Oliver Meacock (2014, from Sys.Bio. 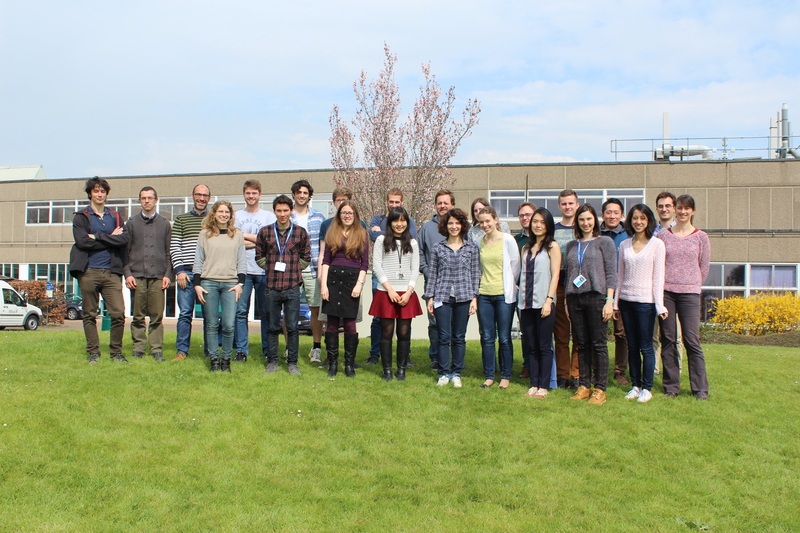 Part III, with Dr Rafael Carazo Salas), Josh Pendry (2014), Andreas Kern (2015), Georgia Vann (2015), Rhodri Kendrick (2015), James Richards (2015), Theresa Jakuszeit (MPhil, 2015), Julius Schmidt (2017), Abhishek Ambekar (2017), Neil Clegg (2017), Jordan Osborn (2019), Filip Ayazi (2019), David Liu (2019), Peter Guzdziol (2019). A few Laurea thesis students from Italy: Marco Leoni (in 2007, PhD in Bristol), Roberto Bondesan (2007), Elisa Tamborini (2008, PhD in Montpellier), Marco Grisi (2010), Agostino Romeo (2010, PhD in Parma), Lucia Parolini (2011-2012, now PhD with us), Luigi Feriani (2013, now PhD with us), Federico Fanalista (2014-15, now PhD in Delft), Mariachiara Romboli (2014-15), Chiara Soriani (2016). A few stagiaires from France: Sarra Achouri (Univ. 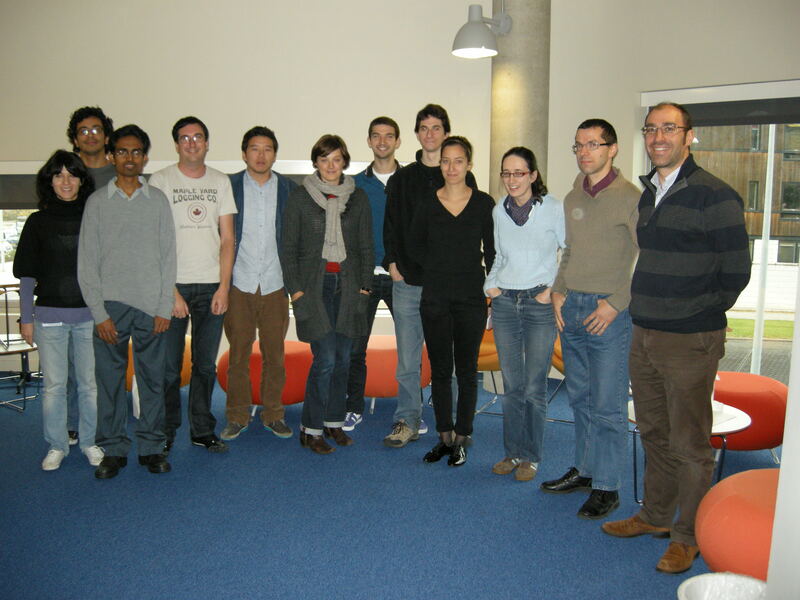 Paris, 2007, then PhD student with us), Nicolas Bruot (ENS Cachan, 2009, then PhD student with us), Loic Damet (Univ. Paris, 2010), Romain Lhermerout (ENS Cachan, 2011), Maya Juenet (ESPCI, 2012), Benoit Meijer (ESPCI, 2012), Antonin Gallet (ENS Cachan, 2013), Tommaso Bertoni (UPMC, 2015), Raphaelle Taub (ENS Lyon, 2015), Amelie Chardac (ENS Lyon, 2016). Project students from elsewhere: Marte van der Linden (Utrecht, NL, 2013), Carmen Sanchez de Rojas Candela (Toledo, Spain, 2015), Aneek Biswas (IIT Kanpur, India, 2015), Bruno Carlo Borro (Copenhagen, 2016), Benedick Fischer (Tuebingen, 2017). October 2017. 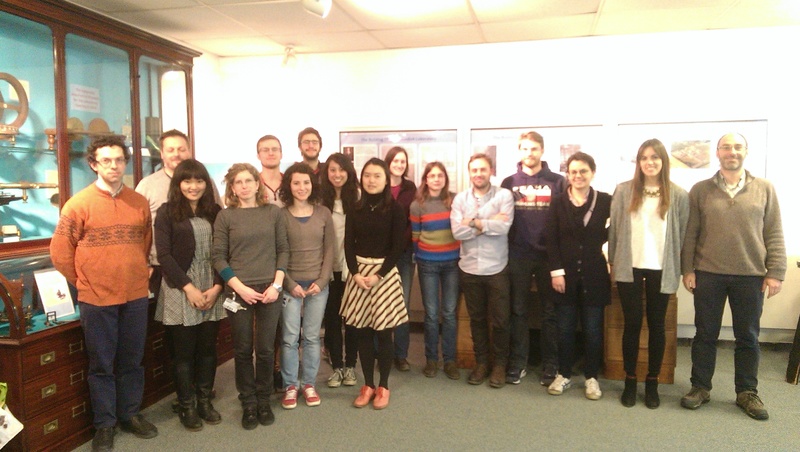 Left to right: William Kaufhold*, Maurizio Chioccioli, Jurij Kotar, Lorenzo Di Michele*, Evelyn Hamilton, Nicola Pellicciotta, Yen Chun Lin, Emma Talbot, Viola Introini, Cornelius Bausch, Weichao Zhai, Ryan Brady*, Mia Panlilio, Luigi Feriani, Omar Amjad, Simone Di Leo, Pietro Cicuta. We missed out on Michal Wlodarski, Sho Takamori, Estelle Brendon. (*) Lorenzo is an independent investigator, Ryan and William are his PhD students. Older photos below. April 2016. Left to right: Nicola Pellicciotta, Jurij Kotar, Pietro Cicuta, Eugenia Cammarota, Luigi Feriani, Bruno Carlo Borro, Omar Amjad, Ryan Brady*, Evelyn Hamilton, Lorenzo Di Michele*, Yen Chun Lin, Maurizio Chioccioli, Lucia Parolini, Emma Talbot, Chiara Soriani, Armando Maestro, Weichao Zhai, Michal Wlodarski, Viola Introini, Sho Takamori, Mia Panlilio, Joachim Rambeau, Estelle Brendon. We missed out on Tim Rudge. (*) Lorenzo is an independent investigator, Ryan is his PhD student. Scroll below for older photos. Feb 2015. Left to right: Jurij Kotar, Maurizio Chioccioli, Yen Chun Lin, Eugenia Cammarota, Michal Wlodarski, Luigi Feriani, Lucia Parolini, Victor Allard, Mia Panlilio, Weichao Zhai, Emma Talbot, Theresa Jakuszeit, Armando Maestro, Luigi Feriani, Mariachiara Romboli, Carmen Sanchez de Rojas Candela, Pietro Cicuta. Scroll below for older photos. May 2013. 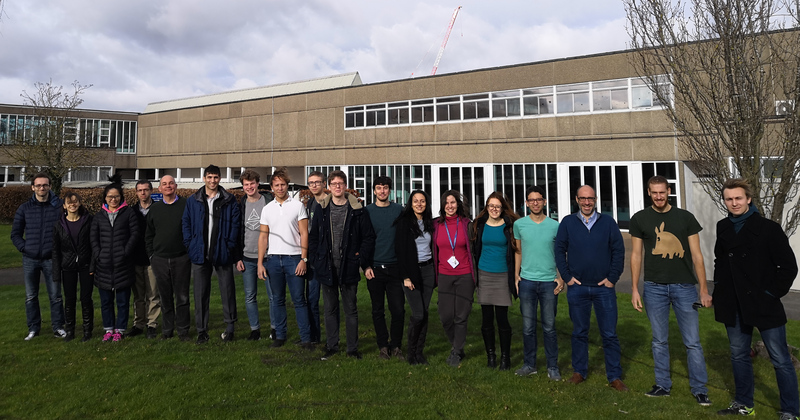 Left to right: Sarra Achouri, Kanat Dukenbayev, Pietro Cicuta, Eugenia Cammarota, Luigi Feriani, Marte van der Linden, Alex Crick, Lucia Parolini, Matt Grant, Nicolas Bruot, Avelino Javer, Antonin Gallet, Will Fletcher. (We're missing Eileen Nugent and Jurij Kotar here). Scroll below for older photos. October 2011. 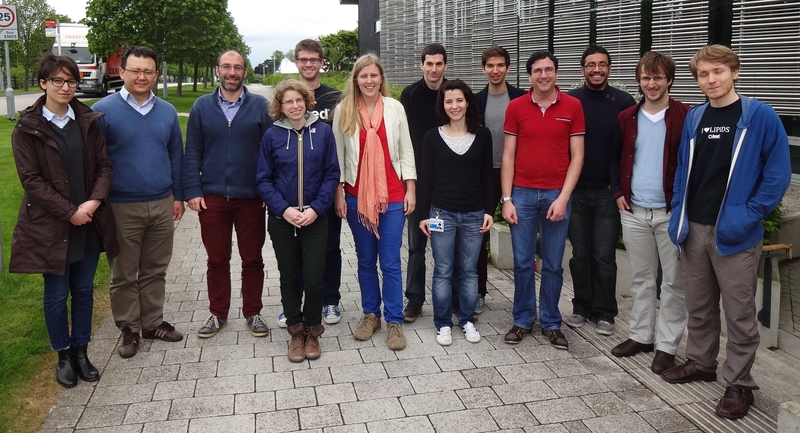 Left to right: Lucia Parolini, Avelino Javer, Himantha Cooray, Nicolas Bruot, Simon Wongswarn, Elodie Aumaitre, Matt Grant, Alex Crick, Sarra Achouri, Eileen Nugent, Jurij Kotar, Pietro Cicuta. (We're missing Krystyna Bromek and Eugenia Cammarota here). Scroll below for older photos. November 2010. 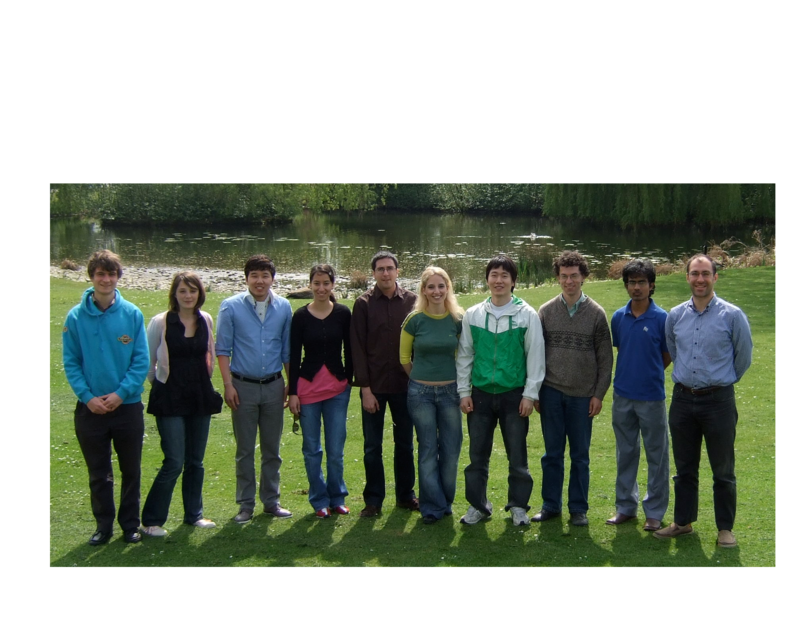 Left to right: Himantha Cooray, Jurij Kotar, Avelino Javer, Matt Grant, Simon Wongswarn, Alex Crick, Elodie Aumaitre, Nicolas Bruot, Eileen Nugent, Aidan Brown, Debjani Paul, Krystyna Bromek, Young Zoon Yoon, Pietro Cicuta. (We're missing Sarra Achouri here). Summer 2009. Left to right: Aidan Brown, Elodie Aumaitre, Simon Wongswarn, Sarra Achouri, Nicolas Bruot, Elisabetta Spigone, Young Zoon Yoon, Jurij Kotar, Himantha Cooray, Pietro Cicuta.